Financial security comes with the security measured in monetary terms. A person holding debit card or credit card issued by a certain financial institute displays a very secured financial environment. Generally, clearing a credit card is kind of like a very effective standardization of life. A person holding a credit card holds a value of debt within themselves. Financial institutions or banks provide credit cards to only such customers, who meets a certain eligibility requirement, but is it possible to get a credit card for low income? Yes, you can. 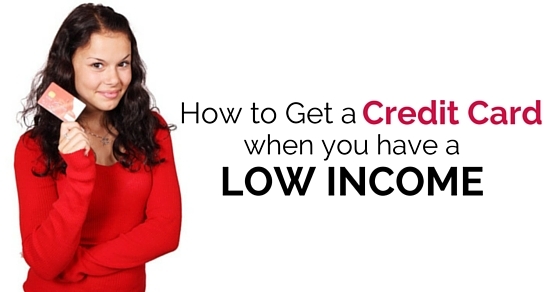 To avail a credit a person needs to meet a certain eligibility criteria. Those criteria can be a financial security statement of that person, if a person holds a secured financial level, then that particular person is eligible to be issued a credit card. A bank or a financial institution has a certain kind of eligibility criteria for those who will be clearing their application for a credit card. To avail a credit card one needs to clear all the criteria of financial security. There is a fixed limit for one to apply for a credit card. A bank or a financial institution creates a fixed rate of income to meet the eligibility criteria. To apply for a credit card one needs to understand that if a person meets the eligibility criteria of financial security, then he/she will be proceeding with the further documentation. To understand the term of financial security the applicant need to submit all the details regarding his / her gross financial income. Gross income level can be measured from the monthly financial income of a working person. This extra income can be stated in the application of credit card to make sure that a person who is trying to get the credit card will be accepted to proceed further. Extra income can be part time jobs, government benefit, self employment and child support, etc . If a person gets rejected to avail a credit card from a bank, then he/she can apply for the same credit card in another bank involving this extra income details without any mistake and this be counted on one’s gross total financial income. If a person needs to apply for a credit card if after having a low financial income then to be smart enough that person needs to show the financial institutions that his/her financial income level meets the eligibility criteria. To make that happen one needs to start reducing his / her monthly expense. To understand the smart way of handling it, then he/she can make this expense payment through other sources just for a period of time. If a person already holds a credit card and to avail a different credit card he/she is eligible to proceed, then at that point of time one needs to understand that, if his/her application for a new credit card is getting rejected then it’s best to not to apply for. Instead of that one can apply and compare credit card interest rates with the other bank credit cards which is offering a lower interest rates on credit cards or best interest rates compared to other banks. A person wanting to apply for a credit card should make sure that he/she has a viable source of paying the interest amount of credit card expenses. If a person holds a savings account of a certain bank or other financial institutions, will surely be considered at least to have a credit card. Savings account declares that the person applying for a credit card does have a viable source of interest rate repayment amount. Even a cheque books issued from a certain bank can be considered as a viable source of interest rate amount repayment. A person who is applying for a credit card should at least have a savings account or cheque book statements so the bank or financial institutions offering a credit card should be assured that the person is holding a viable source of financial income. Every financial institution or bank has some rules and regulations to follow all the activities of transactions. A bank can issue a credit card to the person who is eligible for meeting certain constraints. If a person is desperate about his / her stand over credit card acceptance, then he/she can always choose the option of demanding the credit score statement. Credit status is a status where a person understands the gross income calculated on a yearly basis. These credit status can be measured in terms of financial income of that person. If a person holds a debt on financial, material or on physical elements, then he/she should understand the value of his / her debt payments. This will also help to understand the total rate of interest amount to be paid on a yearly basis. Valuation of debts can make things easy for a person to apply for a credit card. And it is important to know all about the valuation of debts so that the status of financial income can be maintained well. After requesting a credit status one can understand the value of his / her financial income in terms of where do you stand. If a person has any clarification regarding the credit score, then he/ she can always clear all the doubts to understand the value of credit score status better. This will help a person to proceed forward with the details of his / her own account to apply for a credit card. If a person wants to apply for a credit card, then he/she needs to measure their financial expenses and income. This combines the level of accuracy to accept credit card from a certain bank. Measurement of income status clarifies certain doubts about his / her financial income. This will give a person the picture of his / her gross financial income. These credit card options helps in the selection of a certain credit card. Every single credit card holds different type of benefits, these benefits can be derived such as shopping benefits, surety benefits, restaurant benefits, fuel benefits and other benefits. Some credit card offers all such mentioned benefits, but rest of some credit card only a certain benefits such as shopping benefits or travel benefits. This may help a person to make his / her decision about applying for a credit card easy and effective. A lower income earner can hold a credit card, even by requesting his / her family or spouse to join them in their credit card limit. This can only happen if a person holding a credit card who may be a family or a spouse having a good credit card limit can make another person to be joined in his / her credit card with his / her own decision. Partial security can be stated under those securities which hold a part of the benefits. As mentioned earlier a partial credit card offers only a certain benefits. These benefits can limit cash outflow and also certain financial benefits. This is a good credit card for a person with lower income level can apply for. By opting for the best credit cards, one can always have an option over credit card application. This will hold a cash outflow and even provides certain benefits overpayments of expenses. This kind of best secured credit cards is suitable for those people who are obtaining a lower level of income in gross financial security level. If a person wants to have a credit card and his / her income level is not supporting his / her then one can always think of starting a side business without thinking over about it. By starting a side business will always support extra income and also encourage your ambition. Even one can apply for credit card with the idea of starting a business so that he / she can start their business. A person holding a credit card can have several credit card benefits. And those advantages of credit card are as follows. The most important benefits of holding a credit card would be, cash savings. A person who has applied for a credit card can start saving cash once after they clear their credit card processing. Credit cards payments can be done in several outlets, such as while going for shopping, travel expenses instead of using cash. One can use a credit card for expensive payments. For example, if a person travels a lot through the flight, then that particular person can avail such benefits in form of availing the benefits of airport lounge or flight facility. Travel benefits of credit card are very common benefits, as travelling costs a bit more than other expenses then travelling expense comes with extra benefits. These benefits or facility can be a reduction in flight charges or other restaurant benefits. These travel benefits add a more weigh on credit card limit through which one can enjoy more after holding a credit card with rewards. Credit history estimation will help one’s financial annual credit outflow. By paying such interest amount accumulated over credit card will help one to make practical decisions over selection of credit card. Credit cards are beneficial in several terms, not just financial terms, but also personal terms. This can be used an emergency cash for certain unpleasant events. This will cover all the expenses incurred without any issue or problem. To end this discussion, one can state that having a credit card will be a benefit, but those who have lower income levels, for them it’s a chance to take on their financial security. A bank provides credit cards to those customers who clear all the eligibility level of credit card for low income based person struggles to meet such eligibility criteria. These criteria help a lower income level person to understand the level of risk he/she may be taking over by applying for a credit card. Credit card comes with a responsibility to hold one’s credit availability. This can be a bit tough for a low-income level person. Therefore, even after knowing all this risk and eligibility criteria, a person with a lower income level can follow above mentioned steps to get a credit card.